Because of the economy in the number of folds and the quality of the movement expressed in the flapping wings, this clever origami butterfly, a creation of designer deg farrelly, is one of my favorite action models. Over the years I have folded it many times, often in black paper at Halloween, telling those I give it to that it’s a flapping bat. People always react enthusiastically to this model. I am very pleased deg farrelly has given me permission to teach his model in the following video. A 10-inch square piece of crisp kami paper is ideal. Otherwise, experiment with papers that are thin and crisp. For a smaller bat cut a 6-inch piece of kami in half making two equal rectangles. Use one of these rectangles to fold the model. Once the wings are around your finger hold the wings tight to your finger with the other hand, letting go only when you are ready to make it flap. Hold the bat upside down so the wings point down and then gently make the wings flutter a tiny bit. Then flap quickly and move your hand away. This mimics how bats hang from cave ceilings, then fly away when startled. To learn more about teaching this model as a butterfly, visit deg farrelly’s webpage to read a story that Anne Bedrick wrote. On the website you’ll also find diagrams for the butterfly. Have a Happy Flappy Halloween! This is good for the halloween. Nice post and thank you. I am also into origami. Very nicely explained. I knew already the butterfly and the river story, but you explain very clearly the important points in making it work in a great way. And then the idea of using it as a bat! “Have a happy flappy Halloween”- cheesy, but I like cheesy :) That looks like a fun model! Giving those out on Halloween sounds like an amazing idea! Thank you Amy. 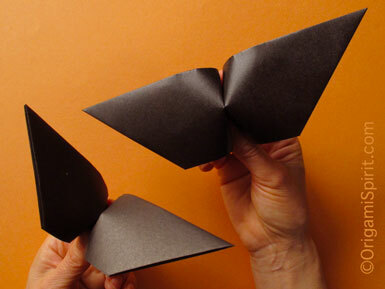 For many years we have been folding origami action models to give away at Halloween. My house is known now as the “origami house” .